Using Vend gift cards with Xero – How can we help? Important: If you integrate with Xero and are looking to set up Vend gift cards, the steps below are mandatory. If you do not map the correct account code to your gift card payment type and to your account for liabilities in the Vend - Xero mappings page, gift card sales and redemption will not flow through to Xero. First off, you will need to make sure you have a current liability account for gift cards in Xero. Create one if you haven't already and ensure that 'enable payments' is ticked. If 'enable payments' is not ticked, payments will not flow through from Vend and liability will not be reduced when gift cards are redeemed. Note: The account code and name listed in the screenshot above are for example only, you do not have to use these when creating your own account. 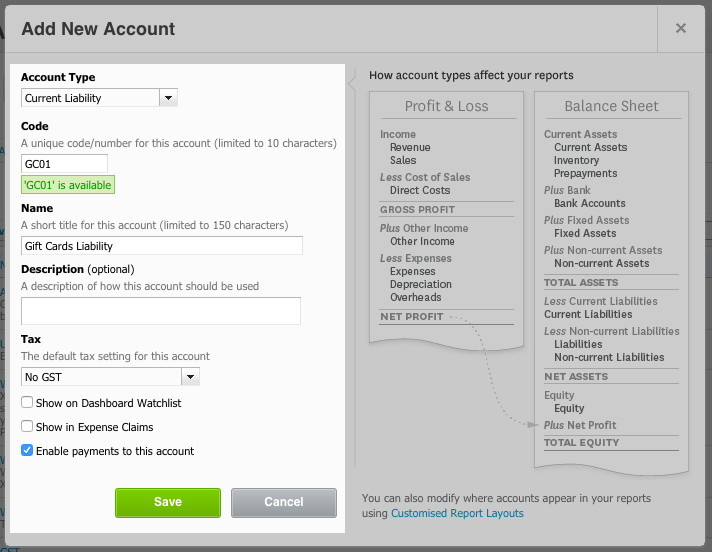 Next, you will need to map this Xero liability account correctly in the Vend xero setup screen. This is so that all gift cards sold will post liability across to Xero and that liability is reduced when gift cards are redeemed. 2. First, navigate to your 'Accounts for Liabilities and Expiry' section and choose your liability account underneath 'Gift card liability'. Setting this up will mean that all gift cards sold will post liability across to Xero. 3. Next, navigate to your 'Accounts for Payment Types' section and choose your liability account underneath 'Gift card'. Once this is done your liability will be reduced from Xero when a gift card is redeemed. Note: If you are using gift card expiry dates you will also need to choose your desired revenue account underneath 'Gift card expiry revenue'. Setting this up will mean that the remaining value of all expired gift cards will be posted as revenue to Xero. Now that this is setup, all gift cards sold will post liability across to Xero and everytime a gift card is redeemed your liability will be reduced in Xero. Note: Liability will flow through to Xero when you close your Register for the day. What happens in Xero when a gift card expires? When a gift card expires, liability will be reduced in the Xero account you mapped with gift card liability and increased in the Xero account you mapped with gift card expiry revenue.